Monthly heart offering dedicated to cultivating self-care and self-compassion for the mindfulness-informed professional. This class is designed for anyone who incorporates or wishes to include the attitudes and practices of mindfulness in their service to others. Join us for monthly explorations of how to incorporate best practices related to self-care and self-compassion into our personal and professional lives. 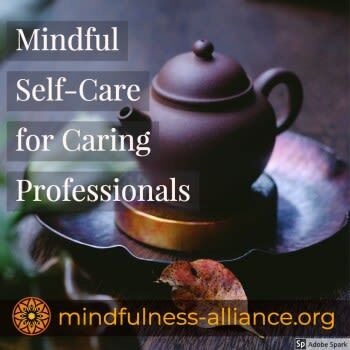 Network, nourish yourself with some coffee or tea and a mid-morning snack, and learn with other mindfulness informed professionals while investing in your own resilience and vitality while reducing the risk of caregiver burnout, moral distress, and compassion fatigue. Attend one or all six! 1.5 CEs available per class for KS & MO licensed mental health professionals. Once you've purchased your passes, visit the calendar to register for the classes you'd like to attend.